How is it that a patent this brilliant was filed in 1932 but has yet to become the national sensation that it so deserves to be? It fills bananas with ice cream, people! 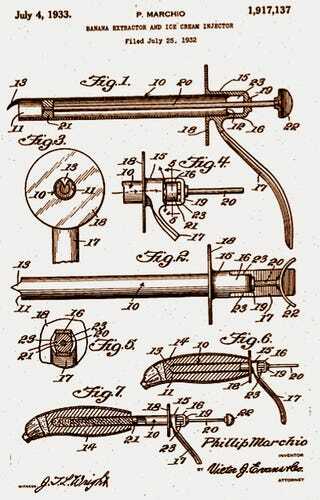 "The invention relates to an implement for coring bananas and filling the latter through the cored portion with ice cream and more particularly to a banana extractor and ice cream injector. The primary object of the invention is the provision of an implement of this character, wherein the barrel or cylinder thereof is formed with a knife tip so that the said barrel or cylinder can be readily inserted within a banana to bore or core the same and thereafter a charge of ice cream introduced within the banana so that the same may be consumed, that is, the ice cream, on the eating of the banana, thus effecting a combination of banana and ice cream in a convenient and attractive form."